The Epiphone Dobro Hound Dog Round Neck Resonator, Vintage Brown provides the iconic Dobro resonator guitar, that defined bluegrass and folk music; yet with a modern twist. The Hound Dog Resonator is crafted with a laminated maple body that delivers exceptionally bright and responsive tones, with good levels of sustain. The maple body features a classic Dobro Single Cone resonator, to create a full, rich tone that resonates well, to give the guitar that distinctive and unique sound. The resonator is topped with a nickel plated fan cover that contrasts beautifully with the rich Vintage Brown finish, to create a classically modern appearance to match the sound. 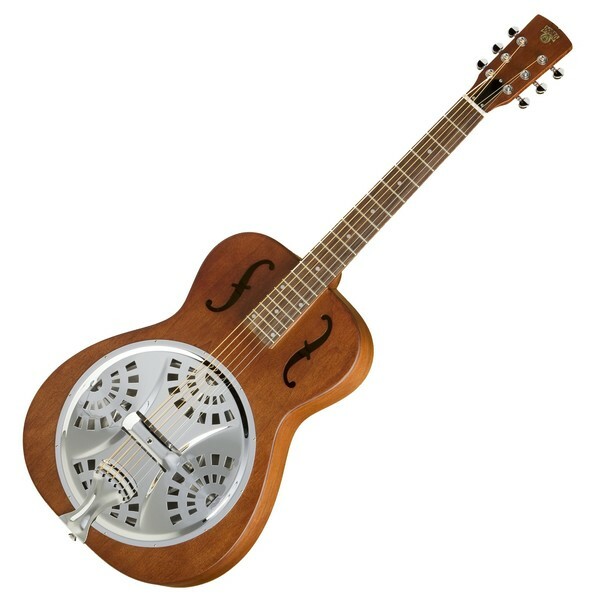 The Hound Dog Round Neck Resonator has a warm mahogany neck that is paired with a rosewood fingerboard for enhanced softness and articulation. The Epiphone Dobro Hound Dog Resonator is complete with classic 'F' holes, a 3-a-side headstock and a nickel plated tailpiece, to create an unmistakably bluegrass appearance. The Hound Dog Round Neck is crafted with a maple body, that yields plenty of bright and tight tonal characteristics, ideal for bluegrass and folk styles. Maple as a body tonewood delivers excellent levels of sustain, and it holds a strong, upper midrange with good bite. The maple body has 3.5" of depth, and features a Dobro single cone resonator for increased sonic possibilities. The resonator is topped with a nickel plated fan cover, which contrasts well with the Vintage Brown finish, providing a classically vintage guitar with a modern twist - both visually and sonically. 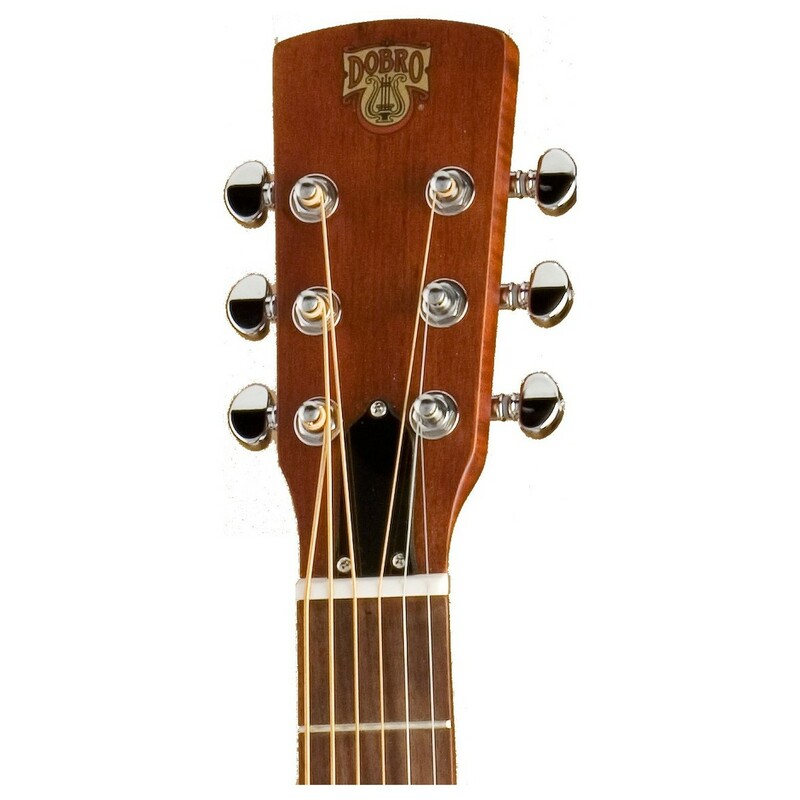 The mahogany neck joins the body at the 12th fret, and it features a round shape that provides the player with comfort. The mahogany neck infuses the Dobro Hound Dog Resonator with beautiful warmth, resonance, and a clear top end. The neck is topped with a rosewood fingerboard that adds warmth and clarity to the overall tone, while its smooth surface provide a comfortably energetic playing experience. The Dobro Hound Dog Round Neck Resonator is equipped with reliable hardware, including premium Grover machine heads, a Spider bridge and a nickel plated tailpiece. Grover Tuners provide the guitar with precise intonation that you can rely on throughout the night, and the classic Spider bridge features an ebony saddle upon a maple base; which projects a loud and sharp tone. 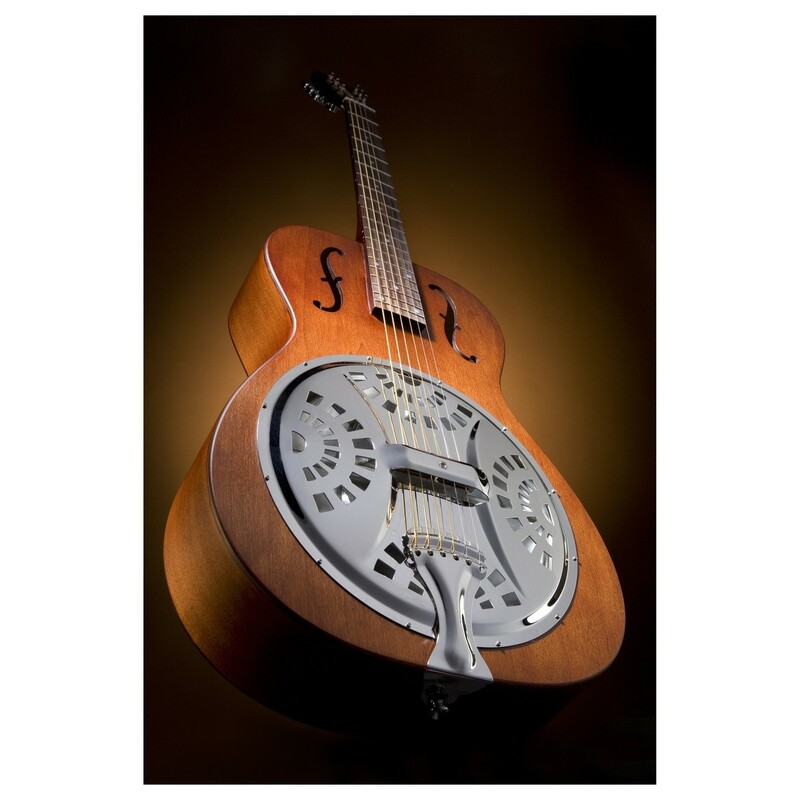 The Dobro brand of resonator guitars is deeply intertwined in guitar history. Synonymous with the resonator, today the Dobro brand's heritage and traditions live on through the Gibson and Epiphone brands, offering players affordable ways to experience the joy of owning a classic Dobro. The Dobro arrived in the 1920s and it has been an American classic ever since. The resonator guitar is an iconic instrument of choice for country, folk and bluegrass styles, with its distinctively resonant tone.